This topic was published by DevynCJohnson and viewed 810 times since " July 28, 2015 @ 06:00UTC ". The last page revision was " October 10, 2015 @ 12:34EDT ". 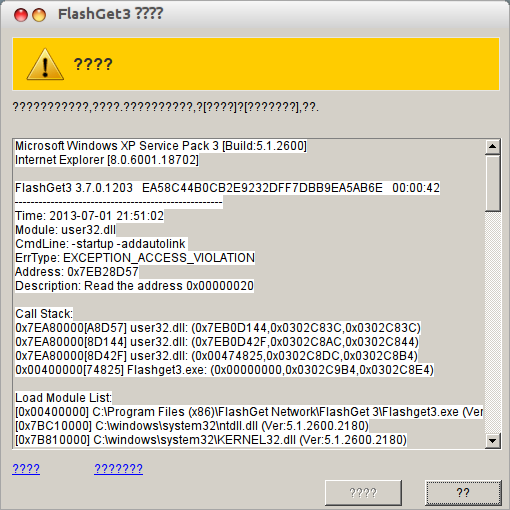 Many Linux users may find a program for Windows that lacks a Linux version or parody. As numerous Linux users believe, the program will not work on Linux. For the most part, they are wrong. There is a way to run a Windows program in Linux without using virtual machines. However, this trick does not work for some Windows applications, especially the newer programs. NOTE: WINE is not an emulator. The application that will allow Linux users to run Windows applications on their Linux system is called WINE - "WINdows Emulator" (incorrect) or "Wine Is Not an Emulator". WINE is made and hosted by WineHQ.org. WINE is a compatibility layer that, according to WineHQ, "translates Windows API calls into POSIX calls on-the-fly". WINE is a compatibility layer, not an emulator. WINE does not perform any kind of CPU emulation; it literally converts Windows calls to POSIX calls. As a result, many could say the Windows program is running directly in Linux because there is no emulator or virtual machine. The performance of the majority of programs are not negatively effected, so there is no need to worry that WINE will make the Windows program execute slowly. WineHQ has a small list (http://appdb.winehq.org/) of popular Windows applications and video games to show that WINE can handle a variety of Windows programs. To install WINE, install it through the package manager or type add-apt-repository ppa:ubuntu-wine/ppa; apt-get install wine in the command-line. These commands will install WINE and its dependencies. Once finished, WINE can be configured. To configure WINE, look in the applications menu for WINE. usually, WINE gets its own submenu - "WINE". Alternatively, users can search for WINE if they are using Unity. Whether the user finds WINE in Unity or other user interfaces, click on "Configure WINE" once found. The configuration window will take some time opening if this is a fresh WINE install. Once open, users can control how WINE behaves. By default, WINE will act like Windows XP, but users can change this to all or almost any Windows version. The next tab over is used for configuring DLL files. 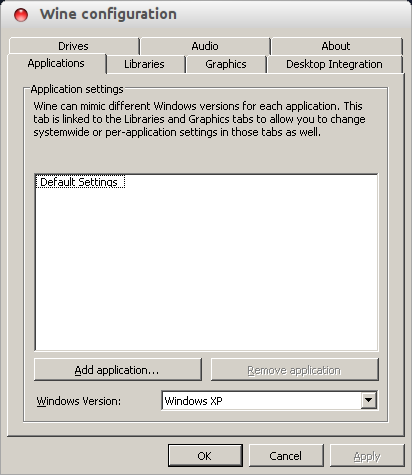 The "Graphics" tab controls the look of the Windows applications. 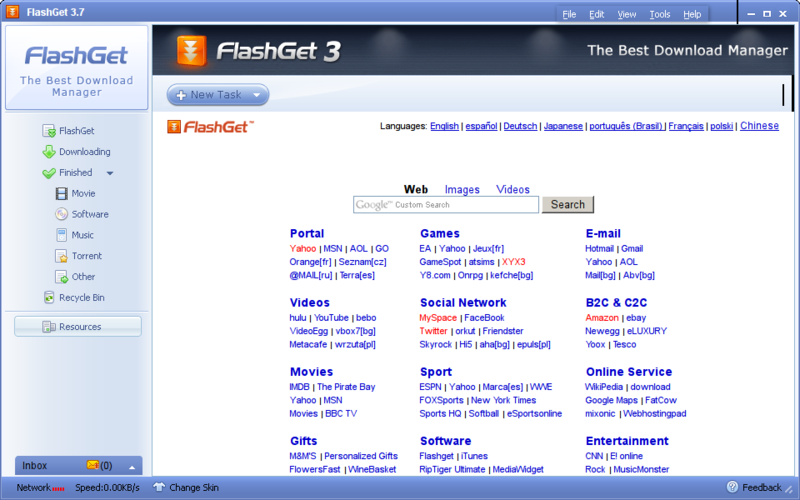 The "Desktop Integration" tab allows users to change the theme of Windows applications. The controls under this tab also allow users to configure folder locations. This means when Windows applications need to place data in the documents folder, users can choose what folder will be the Windows document folder. Next, the "Drives" tab contains options for the Windows drives. Users can control what directory will behave like drive C. Obviously, the "Audio" is for audio. Finally, the last tab, "About", contains the license and version information for WINE. At the bottom of the window, users can type the owner and company of WINE like they would for a Windows system. Once all of the settings have been configured, press "Apply" and exit the program. To use a Windows application, right-click an executable and choose to open with WINE or "WINE Windows Program Loader". After the application installs, look for it in the applications menu under "WINE -> Programs" as I did for FlashGet (until it crashed). Wine-Apps.org is a site that hosts applications, themes, and dll files for WINE. These are free downloads, and users are welcome to add to this website, as long as the uploaded content is legal and pertains to WINE. A MAC Msstyle, for instance, can be downloaded (http://wine-apps.org/content/show.php/Mac+OS+X+Leopard+Msstyle?content=92648). Once finished and uncompressed, users can add this theme by going to the "Desktop Integration" tap in the configuration window. The gnome-exe-thumbnailer provides better icons for dlls and other Windows files. This thumbnailer can be downloaded here – http://wine-apps.org/content/show.php/gnome-exe-thumbnailer?content=129667. Most users should be able to install this via the system's package manager. Alternatively, users can go here (https://launchpad.net/~ubuntu-wine/+archive/ppa/+packages) for the gnome-exe-thumbnailer and other WINE applications. Once installed, users can open Nautilus and see that files pertaining to Windows look nicer. Overall, WINE is very easy to use. After a program is installed, the program can be accessed like Linux applications. Many Windows programs seamlessly integrate with the Linux system. This allows users to use Windows programs with their favorite Linux operating system without needing a Windows system.